JEE Main Analysis April 2019: JEE Main Paper 1 for the April session is being conducted from 8th April 2019 to 12th April 2019. With 2 shifts every day, there are a total of 8 shifts spanning across 4 days – 8th, 9th, 10th, and 12th April 2019. Candidates appearing for the exam today will be looking for JEE Main Today Paper analysis 2019 to get an idea about the exam and their performance in it. At the same time, students who are about to appear for the exam next year need the JEE Main exam paper analysis 2019 to understand the nature of the exam – the difficulty level, type of questions asked, etc. so that they can prepare better. In this article, we will provide you with JEE Main paper analysis for all shifts. You can also get the JEE Main 2018 Paper Analysis. Our experts are also solving the questions and we are providing the JEE Main answer key along with video solutions. Check the JEE Main Trend Analysis from below. After the release of the official JEE Main answer key, students must have checked their answers to estimate their score. Meanwhile, it is possible that some candidates must have felt that some questions were not having a proper option as an answer. On the other hand, they may have multiple other correct answers too. There may be some other cases too where students must have landed in confusion regarding the correctness of the question asked in JEE Main 2019 April session. To help you with this, our experts at Embibe have analyzed the JEE Main April paper and have expressed their views by solving the JEE Main April questions. This could be termed as the errors in the JEE Main April Paper and students can expect bonus marks for such questions. Thus, we have provided you the subjectwise errors in Questions from JEE Main April 2019 with detailed solution, Date of Exam, Shift, Question ID (NTA ID), and have explained why it is incorrect. To find it out go through the table below. Student’s reaction from Kanpur for JEE Main 12th April Shift 2. Check what is the student’s reaction on JEE Main 12th April Shift 2 from Kanpur and student’s reaction on JEE Main 12th April Shift 1 from Kanpur question paper and about the exam. Question 2: In which city was Zaha Hadid born? Answer: Zaha Hadid was born on 31st October 1950 in Baghdad, Iraq. She was famous for her radical deconstructivist designs. In 2004 she became the first woman to win the Pritzker Architecture Prize. In 1983 she gained international recognition with her unconventional painted entry for The Peak, a recreational center in Hong Kong. Question 3: What are Helical Staircases? Answer: Helical staircases, sometimes known as ‘curved staircases’, often form a continuous “C” shape with a larger consistent radius. They can also be made to form an oval or elliptical shape configuration. The key difference between spiral and helical staircases is that a spiral staircase has a central column supporting the threads whereas a helical staircase has a void in the middle – it has no central column. Question 4: Paraquet flooring is made of? Answer: Paraquet (from the French “a small compartment”) flooring is made from dozens of pieces of wood that are fitted together. In terms of size, it can be as small as a bathroom or as large as a ballroom. As this type of flooring needs to be eye-catching, it’s generally made from various wood types with varying grains. The purpose of Paraquet is to provide a surface for people to walk on and to also cover the joists, of the floor. Answer: The Khajuraho group of monuments were built between 950 and 1050 by the Chandela dynasty. Of the various surviving temples, the Kandariya Mahadeva temple is the most famous and is decorated with a lot of sculptures with intricate details, symbolism, and expressiveness of ancient Indian art. Question 6: Saas Bahu Temple is located where? Answer: Saas Bahu temple is a 11th-century twin temple in Gwalior, Madhya Pradesh. It was built in 1093 by King Mahipala Kachchhapaghata Dynasty. The twin temples are located in the Gwalior Fort. Question 7: In which city is the leaning tower? Question 8: Which is the tallest building in Bengaluru? Question 9: Which is the fort of Hyderabad? Answer: The most famous fort in Hyderabad is Golconda Fort. JEE Main April Exam is ongoing! Are you worried about the JEE Main 2019 paper? We have your back! 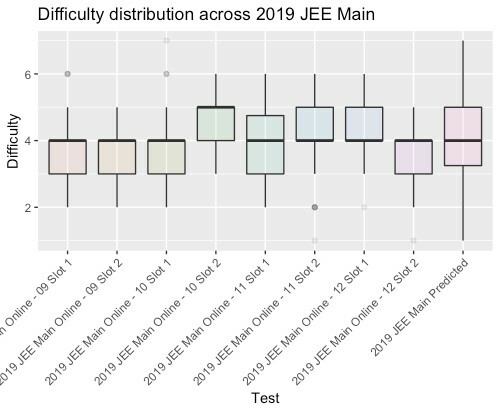 India’s best data scientists have analyzed the JEE Main papers of the last 22 years on various parameters and generated the JEE Main Predicted Question Paper. Embibe’s JEE Main January Predicted Question Paper is India’s first and only predicted test powered by AI and data science, having 95% chapter similarity to the actual JEE Main January question paper. Embibe has a large repository of student attempt data. This data collected on our platform over many years along with Embibe’s Knowledge Graph gives us insights into the paper on various dimensions – difficulty, time to solve, important concepts and chapters, and concepts and chapters where students are likely to make mistakes, etc. JEE Main Analysis 2019 (January): Were There Concepts That Were Asked For the First Time? As can be seen, very few new concepts were added in JEE January 2019 papers. JEE Main Analysis 2019 (January): Which Are The Concepts Where Students Will Not Do Well? JEE Main Analysis 2019 (January): Were There Important Chapters That Appeared Across All Papers? There are 20 chapters that appeared in all 8 papers. Most of these chapters have regularly appeared in the previous year exams as well. JEE Main Analysis 2019 (January): How Did Embibe’s Predicted Paper Do? Every year Embibe publishes a predicted paper for students to practice. Every year the predicted paper has an excellent number of common chapters with the actual test. This year was no different. JEE Main Analysis 2019 (January): Do Specific Skills Matter? 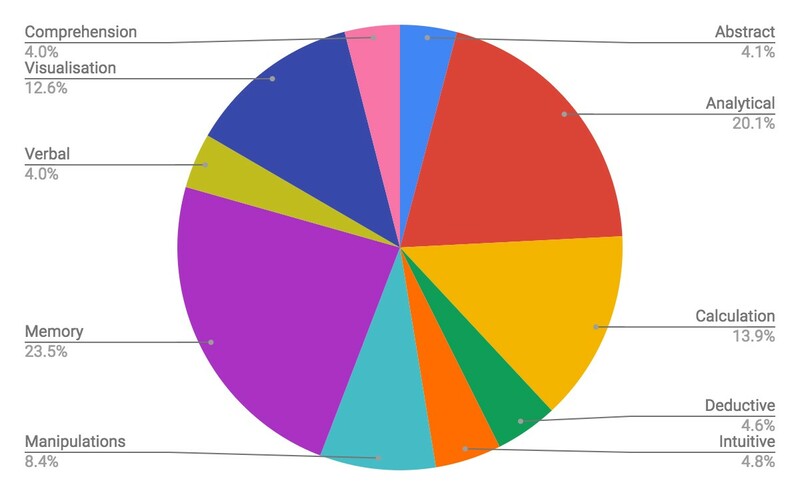 The following chart shows the break-up of skills required to solve JEE Main 2019 January papers. Memory, Analytical, and Calculation are the most important skills for students. JEE Main Analysis 2019 (January): Was Any Paper Particularly Difficult? The following is the overall difficulty level of all 8 papers, with the average difficulty being 4.01, similar to the difficulty level of 4.22 of the predicted paper by Embibe. The paper on 10th January Slot 2 was the toughest with difficulty level of 4.54, whereas the paper on 12th January Slot 2 was the easiest with the difficulty level of 3.67. JEE Main Analysis 2019 (January): Was Any Paper Lengthy? Time to solve for an exam is the sum of the time required to solve all the questions in a paper. In terms of time required, 9th January – Slot 1 paper was the longest with 111 minutes needed to finish it. The paper of 12th January – Slot 2 was the shortest at 84 minutes. 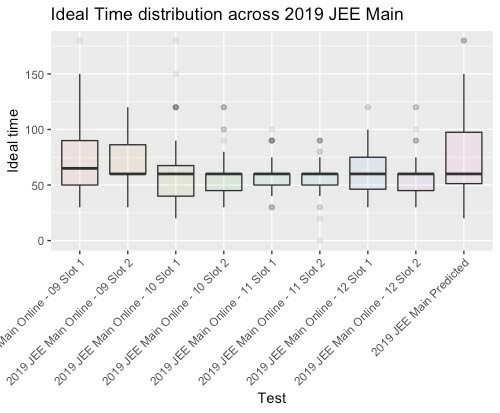 JEE Main Analysis 2019 (January): What Is The Time Distribution Section-wise? Let’s examine the section-wise time needed for each of the papers. Chemistry requires the least time in all papers whereas Physics or Mathematics is the most time-consuming depending on the paper. So, with this JEE Main analysis 2019, you have a clear idea about JEE Main 2019 January and April session. You know how difficult the paper was across slots and the type of questions asked. Candidates appearing for the exam next year should make use of this JEE Main analysis 2019 and prepare accordingly. Finish the whole syllabus and solve as many JEE Main practice questions as possible especially from the important chapters for JEE Main and the chapters where you are weak at. Take JEE Main mock tests and work on your weaknesses. Develop a proper test-taking strategy as well. All these things will become extremely easy with Embibe’s Artificial Intelligence-powered too called RANKUP. It will provide you with step-by-step guidance on how to improve your knowledge and test-taking skills, keeping in mind your strengths and weaknesses. This, in turn, will improve your score by up to 60 percent in just 10 tests. So, what are you waiting for? 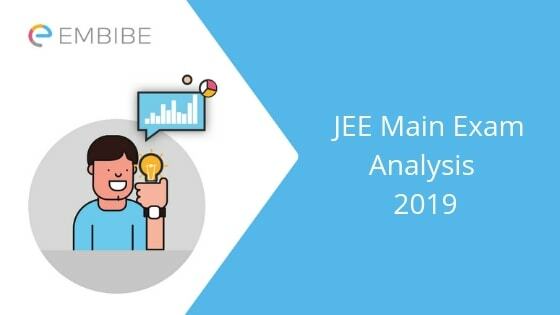 We hope this detailed article on JEE Main analysis 2019 helps you. If you have any question regarding JEE Main analysis 2019, ask them below and we will get back to you at the earliest.